Biochar is the residue remaining when biomass (wood, paper, grasses, manure, other compostable biomatter, yard waste, etc.) is burned without enough oxygen available to allow for complete combustion (a process called pyrolysis). Long advocated by some as a potentially important, carbon negative, waste disposal methodology capable of turning waste into a valuable product, biochar has attracted the attention of both university and government sponsored researchers over the past several years. Academic research, as the result of hundreds of recent studies, is demonstrating biochar has the potential for very significant, and widely recognized, applications in greenhouse gas reduction strategies, water and soil mediation and remediation projects, forest fire reduction efforts, and agricultural crop enhancement approaches. Internationally renowned investment consultants are projecting double digit growth in the market for biochar worldwide for the next several years, and new companies are overcoming the challenges of manufacturing the product in economical and environmentally sensitive ways. In the future, the waste disposal and waste products industry is likely to be profoundly, impacted both financially and structurally as the potential uses for biochar are better understood and products based on those uses support a rapidly growing, and sustainable, marketplace. Biochar is the solid product remaining after biomass is heated to temperatures under oxygen deprived conditions (pyrolysis). Biochar is characterized by high porosity and a high-specific surface area (total surface area of a material per unit of mass). That porosity and specific surface area results in a broad range of benefits, known and potential, just beginning to be fully explored by researchers. Biochar is part of a family of products created by the thermal conversion of biomass called “Black Carbons.” While biochar is a black carbon, better known products resulting from the thermal conversion of biomass like charcoal, carbon ash, coke, soot and all kinds of other materials, are not biochar. The distinction is important because the conditions under which biochar is manufactured create both the economic and the environmental value of the product, especially in modern applications. Equally, no two biochars are exactly alike. The characteristics of each biochar are intimately influenced by the feedstock used to manufacture the material, the temperature the material is “cooked” at, and the length of time invested in creating the product. In general, the underlying assumption in most discussions of biochar outside the research community is that the material is manufactured to achieve greenhouse gas emission reductions (GGRs) and/or other benefits from a biomass feedstock that would otherwise end up releasing most or all of the carbon it contains to the atmosphere in some way be it rotting, incineration, waste processing or some other breakdown process. GGRs in one degree or another are intrinsic to nearly all biochars but most biochars provide significant additional benefits as well. For an industry to grow, economically feasible means of production must be in place to serve a stable and growing marketplace capable of allowing initial risks to pay off in acceptable profit levels over time. 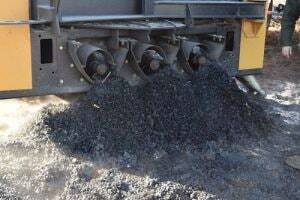 Until very recently, a serious issue acting as a governor on the engine of the biochar marketplace has been the lack of appropriate equipment; equipment capable of producing significant quantities of biochar at a cost allowing for both profitability and sustainability. Basic biochar is extremely easy to make. In southern Oregon, the Umpqua Biochar Education Team has developed kiln designs available to small scale users and published them on the internet for the use of anyone interested. On Orcas Island, Washington, the biochar used by University of Washington grad students and professors to study soil enhancements provided by the product was “manufactured” in a 50-gallon drum. Across America, unknown thousands of gardeners and farmers make biochar in small quantities for personal use. Also, in the U.S., a number of larger scale manufacturers of biochar exist, albeit scattered across the country. A recent survey and analysis report by the U.S. Biochar Initiative, a non-profit research group supporting biochar research, marketing, and quality standardization efforts, indicates a significant part of the biochar produced in the U.S. today is produced as a byproduct of other efforts (biomass co-generation, waste disposal plants and so on). A large gap in capacity exists in the middle of the two producer groups. In 2015, Anders Ragnarsson, the founder of one of America’s major chipping and grinding manufacturers, Continental Biomass Industries sold the company and began to turn his attention to what he saw as a potentially burgeoning, and environmentally important biochar industry. Realizing biochar could never live up to the potential it has to dramatically reduce greenhouse gas emissions to the earth’s atmosphere without a way to bring equipment to the biomass rather than having to transport accumulated biomass over long distances to regional processing facilities, Anders set out to develop economically viable and transportable equipment capable of consuming significant quantities of biomass, and thus, producing commercial quantities of biochar—all in a localized setting. Anders’ investigations came to fruition in 2017 when he, working with a team of associates with extensive experience in waste handling and disposal, established a company to bring a new kind of technology to the biochar manufacturing scene—ROI (Ragnar Original Innovation). ROI’s line of “Carbonators” allows, for perhaps the first time in America, for economical, large scale, and importantly, mobile, processing of waste to biochar aboard a unit capable of converting in excess of 20 tons of construction and demolition debris, logging slash, agricultural “waste,” and other biomass per hour into about a ton of biochar suitable for local, regional, and even national markets. Initial sales of the Carbonators have also been well beyond what the company had hoped for indicating, according to O’Connor a large market has been pent up behind the dam created by a lack of suitable equipment. “Feedback from those attending our tour has confirmed our belief that the market has been starved for a way to economically achieve large volume reductions in locally sourced biomass through a single step process that does not require pre-processing, transporting over long distances, and post-processing steps requiring excessive handling,” he puts forward. The future for biochar is seen as bullish by investment research firms. A quick search of the internet reveals a widespread belief across a number of top of the line investment analysists that the biochar marketplace will see double digit growth at least through the mid 2020s. Reports are available from individual companies discussing both growth overseas and in the U.S. Agriculture is generally spotlighted as an especially high growth sector. Supporting the analysis by investment consultants, a recent survey by the U. S. Biochar Initiative (http://biochar-us.org/news/us-biochar-market-survey) found strong sentiment among both biochar users and producers pointing to a growing marketplace with agriculture seen as the market sector likely to see the strongest growth followed by filtration and odor control. A full discussion of the many attributes biochar is coming to be shown to exhibit, and as a result, the potential market sectors the product is likely to become prominent in, can begin to sound like the patter of an old-fashioned snake oil salesman but the patter is supported by solid research. EPA’s website reveals a wealth of research information regarding biochar’s usefulness in remediating toxic sites including abandoned mines and polluted waterways. A paper available from the U.S. Department of Agriculture’s website (Biochar: A Synthesis of Its Agronomic Impact beyond Carbon Sequestration) reviews some of the extensive literature available regarding the vast potential biochar has in agriculture. One has only to visit Stockholm, Sweden’s International Award-Winning Biochar Project website to realize the place biochar can have in the municipal waste stream. The development of a sustainable marketplace for any product requires both a need to be filled and sufficient product, or potential for product, to fill the need. In America, two huge, and as yet almost entirely untapped, marketplaces for biochar exist aside from the fact that simply producing biochar represents a greenhouse gas reduction effort. Government required remediation of waterways, spent mines, and other compromised landscapes represents a potentially huge market for biochar. Equally, agriculture, including forestry, is an untapped market barely exploited but demonstrated insofar as potential is concerned. A source of raw material to allow for the production of almost limitless quantities of biochar can also be demonstrated. The USDA Forest Service as well as regional, state, and local governing bodies have pointed to the need to treat hundreds of millions of acres of woodlands to reduce wildfires. In addition, each year, weather events in the form of hurricanes, tornados, floods and other incidents leave tens of millions of tons of construction and demolition debris, downed trees, and other biomass available. Even if an all-out effort to manage the nation’s biomass inventory were to be mounted tomorrow, decades would be required to make even a dent in the material available for treatment. The true issue most likely to act as a logjam in the biochar marketplace of the future, as the 2010 report to Congress implies, is lack of equipment available to produce the product in proximity to the raw material. There, American ingenuity will come to the fore as entrepreneurs identify the void in the marketplace and work to meet the needs identified by that void. Biochar has the potential to revolutionize the waste industry in terms of the processing of waste and of thecreation of useful products from waste as a raw material. As a product, biochar is already bringing about a revolution in the carbon reduction, agriculture, and remediation industries though only the tip of the market potential iceberg has been exploited. Much about biochar and its potential uses is still to be learned but, sufficient knowledge already exists in the form of significant research and interest in the product on the part of potential users to assure the biochar industry is one the waste professional wishing to stay on the cutting edge of progress will want to investigate. Over a 35-year career as a Public Policy consultant and writer, Jack Petree has seen more than 3,500 articles published in the professional press. His work mostly revolves around what he calls “practical environmentalism; ways to integrate entrepreneurial efforts and the social policy desires of the larger community and then facilitate communications about those efforts. Jack can be contacted (360) 733-1303 or e-mail tradewrldfreelance@gmail.com.